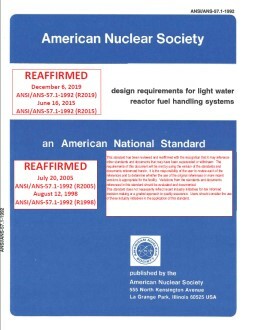 This standard defines the required functions of wet or dry storage facilities for new fuel at light water reactor nuclear power plants. It provides minimum design requirements for safe storage of new nuclear fuel and control components at such plants. The fuel storage facilities covered by this standard are used for receiving, inspecting and storing fuel containing new and recycled uranium and mixed oxides. 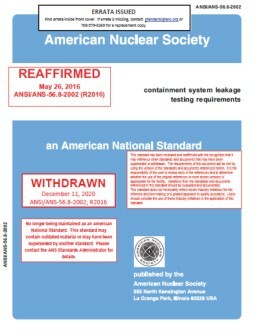 The basis of this standard is that the intended function of the facilities will be performed in an efficient and economical manner to (a) preclude criticality, (b) ensure protection to new fuel assemblies, control components, plant personnel, and the public, and (c) maintain radiation exposures as low as reasonably achievable.